Winter triathlon is a tri-sport event in which athletes are required to compete on running, mountain biking and cross-country skiing as a part of a single race. The entire competition will be conducted on snow-covered surfaces. Winter triathlons are considered to be significantly more difficult compared to the regular swim, cycle, and run triathlons. The sport is practiced mostly in Europe. Races will be conducted on specially designed courses. The nature of the course and the distance for each leg will be decided based on the conditions on the day of the race. A typical course is setup in such a way that it would take world class athletes around 80 - 90 minutes to complete the course. 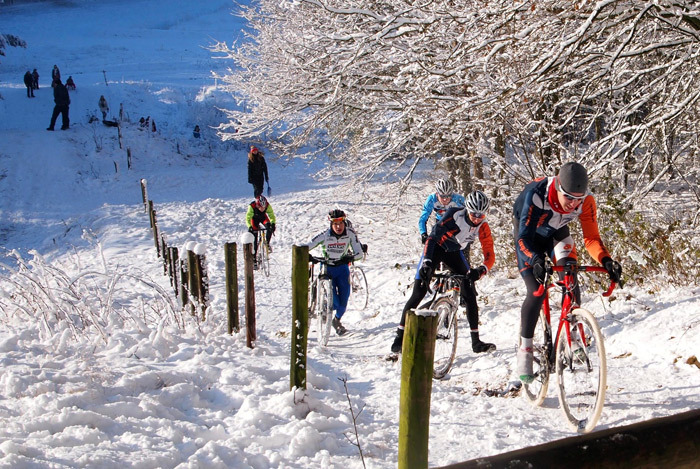 Though not very common, there are few winter triathlon races where the mountain biking leg is replaced by ice skating. Similar to other triathlons, winter triathlon is a direct racing competition in which multiple athletes compete together, and the athlete who crosses the finish line first is declared as the winner. Winter triathlon is included as a part of the winter world championships event. There was a bid made to include winter triathlon as a part of the Winter Olympic Games in Sochi, but it was denied. Triathlon — a race consisting of three events, usually swimming, cycling, and running in consecutive order. Cross-Country Skiing — races over snow-covered terrain using skis. Indoor Triathlon — swimming in an indoor pool, cycling on a stationary bike, and running on an indoor track or treadmill. Snowbiking — uses a mountain bike on snow with fat tires.